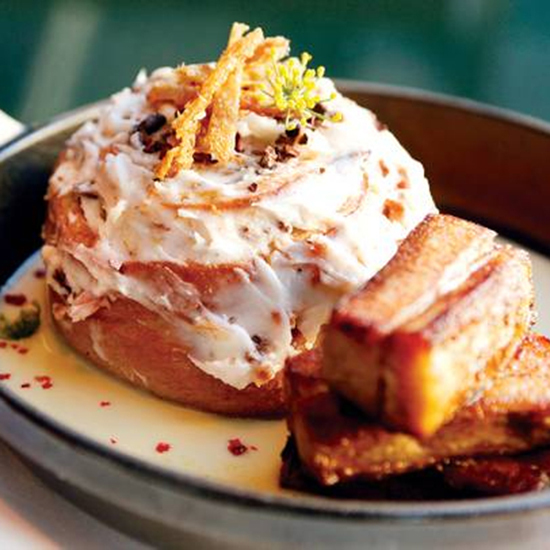 What: We’ve seen some genius sweet–savory brunch pairings before, but the duck confit cinnamon roll (!) at Comme Ça is next-level. Available only at the Las Vegas location, the roll winds duck confit in between those soft pastry layers, and comes with smoked-bacon frosting and a raspberry compote. Wash It Down with: Comme Ça’s drinks program, called 18A in honor of the 18th Amendment, is well-known for its quality cocktails; Sam Ross of Milk & Honey helped craft it. The Rose Eight sits somewhere between a high-octane cocktail and a sippable daytime drink, with bourbon, fresh orange and lemon juices, honey grenadine and rose flower water. It may be stronger than your usual brunchtime mimosa, but hey, it’s Vegas: The normal rules don’t apply.